My friend Jessica just started up a hockey blog. She's a Red Wings fan and she wrote about meeting some of her favorite hockey players at a charity event. I love the way she writes because it's so entertaining. But I also thought that people might want to see how a lot of female hockey fans see the players. I tend to be a bit more aloof when writing about them - intentionally, of course. Not always, but most of the time. I grew up at a time and in a place where women weren't taken seriously if they liked sports no matter what, so it's kind of a knee-jerk reaction to write that way. If I were to gush about how good looking a guy is all the time, along with writing about the sport seriously, I don't know, it makes me feel like I'm undermining my own credibility. I know that I'm not, but it's kind of an ingrained thing with me at this point. Jess blends both a keen hockey knowledge and being a woman appreciating good looking men in a way that I don't think I'll ever manage to do. So if you want to see how female sports fans really are, and be entertained thoroughly by it, go read a bit of her blog. Part II is forthcoming, I believe. I'm soo jealous that she got to meet Yzerman. The Tampa Bay Lightning lost to the Vancouver Canucks 2-1. You know, for a team that has half of its players sick, they really didn't do too badly. If they'd been healthy (as in not sick, rather than not injured), they probably would've won this game. Still it was a good effort, I thought. I'm guessing that Stamkos and St. Louis weren't sick, since they were the two best offensive players. Stamkos looked the freshest of everybody, and played very, very well. Ramo had a great game, too. The best defensive player was Lecavalier, despite not looking like he felt well. I'm including the defensemen in all of that, by the way. Shots in the third period weren't that great. I think that the team lost some steam at that point. They'd played fairly well for most of the game, tho. But at least they limited Vancouver to only 25 shots - which was a vast improvement from previous games. And they weren't bunching up as much as they had been, but they were still doing that every so often. As a side note, I have a bit of a pet peeve. The tv announcers for the Lightning made the homecoming of a few local boys to be a big deal. However, their geography was more than a little shaky. Seriously, if you're going to go there, then at least look at a map so you at least sound like you know what you're talking about. I'm sure that there was one in the phonebook in the hotel room. I can almost guarantee it, in fact. Victoria Island? Abbotsford being south of Vancouver? Kamloops is the gateway to the Rockies? C'mon! I lived for eight years about 50 miles south of Vancouver in Washington State, and that's all kinds of wrong. Just for that, I hope that Mt. Baker hid behind the clouds for the entire trip out there. Never mind. It'd take far too long to explain. It's just the local volcano, that's all. The Tampa Bay Lightning lost to the Edmonton Oilers 5-3. This is a game they could've won. Even with the slow start. Unfortunately, they were only able to convert one of the three power plays that they had. They had a great penalty kills, tho, not giving Edmonton anything on their six tries on the power play. One of the recurrent themes for the season with the Lightning have been shots. They don't take enough, and they give up too many. On the one hand, it's really shown everyone who the good goaltenders are. On the other, it's also shown everyone how inconsistent the defense is. Part of the problem they've had all season has been with positioning. They all want to help the guy with the puck, so they bunch up around him leaving no one in front of the net at either end. It pulls everyone out of position, and gives other teams far too many chances. If there's everyone in front of the net protecting their own goalie, then it's harder to get the puck to center ice and create a scoring opportunity. If everyone's gathered around the goalie at the other end, then there's no one on the blue line to stop breakaways. They need to spread out more and play where they're supposed to - and do the jobs they're supposed to be doing. It's nice to want to help out teammates, but they need you where you're supposed to be and where they expect you to be. The only times they do that is on special teams, and they should be doing that all the time. And when they do do that, and take more shots, they tend to be very competitive in games. Ramo, again, had a good night. Four goals on 45 shots actually isn't bad. It could've been better, of course, but it could've also been far, far worse. So the Tampa Bay Lightning have accepted defeat. That's too bad. I was really hoping better from them. Once a team has accepted the fact that they're not making playoffs, the question that often looms is, "What is there to play for?" And the answer that often follows is, "pride." I think those people have limited imaginations. Pride is a nice idea, but what about being spiteful? What about being the giant killers, the spoilers, the underdogs? What about taking teams down just to prove a point - that the only reason you didn't make playoffs this season is because of a rough start? Why give every team an easy road thru Tampa when you've had to fight for every little thing this season? Why not play to prove people wrong? After all, you beat the second best team in the NHL last night - Boston. And you managed to make it to a shootout with the third best team in the conference a couple of games before - New Jersey. So why just sit back and feel sorry for yourselves when now you can have all of the fun and none of the pressure? And if some of you need that pressure, well, there are a few guys off of the team that could be up for a spot on Olympic squads next season. Don't think the GMs of those national teams aren't watching. They'll be inviting guys to camps over the summer, and they're making their invitation lists right now. They want the best players, after all, and not the best teams - and those don't always coincide. If you want to slack off a bit because you're thinking there's nothing to play for, try playing for a spot (or playing to get a teammate a spot) on Team Canada, Team USA, Team Czech Republic, or Team Finland. It's not just how you play that's going to matter, but how well you hold up thru adversity. Not to mention how good a leader you are. There are plenty of other guys who'll take that spot if you don't want it, if you decide the rest of the season isn't worth the effort. So go ahead. Be spiteful. Own every single team you play for the next 22 games. Make sure you're making the point you want to be making. Because if you don't do it, no one else will. The Tampa Bay Lightning beat the Boston Bruins 4-3. You know, I thought that the Lightning played a much better game against New Jersey a couple of games ago. Of course, I shouldn't really complain since they did win. And against the Eastern Conference's first place team, no less. I see that they're back to allowing 40+ shots a night again. I'd hoped they'd gotten past that. Luckily, Ramo was up for it. Halpern scored for the first time in a long time - so good for him. I'd been wondering for a while now about Halpern - if he was playing with an injury or still recovering from his knee surgery. I consider him to be one of the better players, and leaders, on the team - one of the core guys - so it's good to see him doing better than he has been. So much for the officials calling things against the Lightning. The other night at Carolina was a little shady, but this game was pretty evenly called, I thought. And the officials even helped Tampa Bay out by calling two consecutive penalties on the Bruins in the last few minutes of the game. Sort of blows a hole in the theory that everyone's out to get them, don't you think? Ramo was, by far, the best player for the Lightning. He had to be for them to win it. Faceoffs weren't that great, they weren't shooting the puck all that much, and as I've already mentioned, they allowed Boston 43 shots on goal. Without a good goaltender backing them up and keeping them in the game, Boston would've won this in a blowout. The Tampa Bay Lightning lost to the Carolina Hurricanes 4-1. Now, I'm the first to point out to Lightning fans that the officials aren't out to get the team, and I'm not much of a conspiracy theorist (although, I may seem like I am at times - really, I'm not). However, there was definitely something fishy about this game. The Lightning got some very questionable calls made against them in the third period - which put the game out of reach for them and gave the Hurricanes a three-goal lead. But there was also something screwy going on with the shots. Whoever the statistician is who was tracking the shots, they weren't counting all of the shots that the Lightning took - and I'm not talking about rebounds here. I'm talking about legitimate shots directly on Carolina's goaltender. Having said that, the Lightning shouldn't have to depend upon the officials in order to win a game. They should be doing that all on their own, or despite the officials. But they really didn't play very well. McKenna was the star of the game for Tampa Bay. He kept them in it, even when they might not have deserved to still be in it. I would estimate that the Lightning probably had about four or five shots on goal in the first period (instead of the one that's listed officially). But Carolina had 14. For the game, the Lightning probably had around 20 shots (instead of 13), but Carolina had 41. McKenna stopped all but four - and two of those went in on back-to-back 5-on-3 power plays for the Hurricanes. New Jersey's a much better team that Carolina, and the Lightning stayed with the Devils for the entire game. I'm not sure what happened with this one. They didn't do anything the same as they did last night. Yet again, it was like two different teams. The St. Petersburg Times reported that last month's rumors of trading Lecavalier to the Montréal Canadiens were more than just rumors. Apparently, the Lightning really were talking to Montréal about trading Lecavalier. Vinny didn't know that until game day yesterday against New Jersey, which is probably why he played with a bit of a chip on his shoulder against the Devils. I'd read about this a two or three days ago on the blog, Habs Eyes On The Prize, and there's reputed to be a little more to it than just "talk." Rue Frontenac was reporting that the Canadiens' GM was quoted saying that the Lightning contacted them about the trade - and that the Lightning were actively shopping Lecavalier. The blog also mentioned that only reason the trade didn't happen was because local companies and corporations might withdraw their financial support by way of not advertising with the team (according to TSN). So, Lecavalier is still with the Lightning only because of that. I'm not one to believe everything I read, but I find it interesting that this isn't being widely publicized. You know how it is - if it's not true, you read it everywhere. If it is true, you'll have to dig for it. This has the ring of truth to it to me, and it's the kind of thing that wouldn't be widely publicized if it were true. And now the St. Louis to Pittsburgh rumors make sense. They can't get ride of Lecavalier, so they're probably trying to get rid of St. Louis. It's a salary dump, plain and simple. I'm sure it's nothing personal, of course. "You’ll probably be safe from being traded at a whim since you’re forwards. But then, Boyle thought he was pretty safe, too. You might want to watch your backs, just in case, since I don’t think anybody on this team really is safe – and yes, I’m talking to you, too, Lecavalier. ... I get the impression, even from afar, that you shouldn’t trust these guys – particularly when they’re smiling. "Best of luck to Boyle & Lukowich. It could turn out that you were the lucky ones after all." And it turns out that they were. Have you seen what San Jose has been doing lately? And where they are in the standings? And there's talk that Boyle could be up for the Norris Trophy (Best NHL Defenseman). Two things are at issue here - Lecavalier's contract vs. advertising income. Right now, advertising money is winning, so they feel they can't trade Lecavalier at this time. The other thing going in the fans' favor is that the Lightning are over-estimating the trade value of both Lecavalier and St. Louis. While they're both top-tier players, in most other teams' eyes only Lecavalier is worth gutting their team for. But even then, not for the asking price that the Lightning have put on him. So unless another team is desperate, a trade isn't likely unless the Lightning are willing to settle for less than the sun, the moon, and all the stars in the sky. So now that Lecavalier has finally realized that he is nothing but a commodity - a thing - in the eyes of the management/ownership, it ought to be interesting to see what he does with that. Things, after all, don't deserve consideration nor respect. I'm sure that's not going to sit well with Vinny. If they do trade him, the only phone call he'll probably get will be the one telling him to clear out his locker - and they'll probably chicken out and make Tocchet do the honors. And let's be honest, will he want to play for a team that doesn't really want him, anyways? And if they don't trade him but they do trade St. Louis, will he want to stay? They had a hand in trading Richards away to Dallas, you might remember. I don't know if he'll ask for a trade, but I don't think any one would blame him if he did. The Tampa Bay Lightning lost in a shootout 3-2 to the New Jersey Devils. I thought that the Lightning had a pretty good game, actually. They did pretty well defensively, although, there were a couple of breakdowns towards the end of regulation, and they were consistent in how they played New Jersey. They definitely held their own for the entire game, and you really can't ask for much more than that. While face offs were one of the best aspects of the game for them, penalties and special teams weren't so much. Both of the goals that the Devils scored in regulation were power play goals - one on a Lecavalier penalty, and the other on a St. Louis penalty. If they'd played the penalty kill like they'd played the rest of the game, things might've gone better for them. 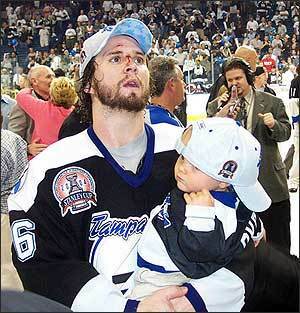 Malone had both Tampa Bay goals, and they were both very pretty. For the first time all season, they were fairly consistent all game in their play. In a good way. There have been plenty of times where'd they'd been consistent in a bad way all game. So I think they're really getting this hockey thing to work for them these days. The Tampa Bay Lightning are still struggling to find some consistency during games. I'm sure their coaches are good guys and doing all that they can to help them out, and I'm sure they've been throwing out a lot of stuff for those guys to digest. But here's what I think is a decent summary of what they need to do. There are three things in hockey that they need to do well to win. And they have to do them all the time, all game long. Everything else is just details. 1. Play defense. Everybody. All game long. Figure out where you need to be at all times, and then be there. Don't get distracted by jumping into a play and getting stuck somewhere that you shouldn't be. Just put your body in the place on the ice where you're role dictates you should be in order to be defensively responsible. There should never, ever be five or six guys with the same colored jersey's hanging out around a net unless that team just scored a goal. 2. Short, clean passes. No blind passes, and no drop passes unless someone calls for it. Stick to stick, tape to tape, teammate to teammate. Make sure they're looking at you and are ready to take the pass. And you shouldn't need any more than four passes in the offensive zone before taking a shot. 3. Shoot the puck. It doesn't matter from where, and it doesn't matter from who. Just shoot it. Often. From everywhere. From everyone. Whether you think you have one or not. And only make a pass on a breakaway if you know you don't have the shot. There should be at least ten shots per period from the entire team - in every period of every game. The more the better. You can never have too many shots on goal. That's it. You do those three things all the time and well, then you should at least be in the game, if not actually win it. The key is consistency. It doesn't matter who the opponent is - you can only control the things that you do. The Tampa Bay Lightning lost to the Chicago Blackhawks 5-3. So the first period, the Lightning didn't shoot. The second period, they got into some fights. And in the third period, they went back to not shooting the puck. There you go - the entire game in a nutshell. The only reason the Lightning were even in this game at all was because of Ramo in the first period. Without Ramo, Stamkos would probably not have had his first career hat trick. The Blackhawks had 19 shots on goal in the first, as compared with the Lightning's three shots. And Ramo was fantastic in the first, and for almost the entire game. Especially considering when the Lightning allowed 49 Blackhawk shots on goal. Stamkos's hat trick was impressive. Especially considering that those three goals came on three shots. The last one where he took a slap shot made me think of Lecavalier. I see that he's already been playing with Vinny for too long, and his rookie season's not even over yet. Speaking of Lecavalier, it's too bad he wasn't able to put the puck in the net on that shot from his knees. That would've been very pretty had it gone in. It was rather chippy out there for most of the game. The second period had a couple of fights, and Downie received an instigator penalty for his - which I'm sure some people might complain about. Frankly, after seeing the replay, and before they made the call, I was thinking that he'd probably get it. He did start the fight, but it wasn't visible in the the replay whether or not he obviously threw the first punch. So I guess it really just depends on how you define "instigator." The first penalty in the third, as well as lack of shooting and allowing so many shots on Ramo, is what finally did them in. That first goal in the third gave the Blackhawks the momentum to claw their way back into the game. And they did. About the only highlight (other than Stamkos's hat trick) was that they converted on two of the five power play opportunities. Oh, and they didn't generate as many turnovers as they did against Washington. They were just awful defensively, tho. And not just the defensemen, but the forwards as well. Tampa Bay was wearing their road whites but they were playing at home, and I have no idea why. I was on the phone when the game started, so I missed that part. I'm assuming that it has something to do with Chicago and some kind of uniform problems they had. If someone knows why they did that, let me know. The Tampa Bay Lightning lost to the Washington Capitals 5-1. I thought that they were still in this game at the end of the second. The Lightning were hitting and shooting, after Ramo came in at the beginning of the second, they'd only allowed one more goal, and they'd managed to get a goal on the Caps goalie. They've come back from being down by three before - a few times, in fact - and it was only 4-1 at that point. And then...I'm not sure what happened. In the third period, they were an entirely different team. They came out flat and stayed that way. They had 14 shots in both the first and second each, and then only 4 shots in the third. Lecavalier was typical of that himself. He had 4 shots in the first, 3 shots in the second, and then only 1 shot in the third. Whatever was said during the second period intermission in the dressing room, it was exactly the wrong thing. It looked to me as if the ice was really bad. The puck kept bouncing around and players were falling. I thought that was strange since the St. Pete Times Forum usually does alright with the ice, I think. Especially considering that it's Florida and all. I'm not sure if McKenna just didn't know what had hit him, or if the teams wasn't giving McKenna the support that he needed. It was probably a little of both, I'm sure. Ramo did a lot better, but, again, it's hard to tell sometimes if that's because of how the team's playing in front of him or not. The Caps jumped on any little mistake that the Lightning made - and while they made a lot of them, it probably wasn't an more than they usually make. Most of the time, those no-look passes that the Lightning try to do (and often end up on opposing teams' sticks) don't get them into too much trouble. But Washington took those little gifts and made it work for them. It wasn't so much that the Lightning played any different as it was that the Caps weren't as forgiving of the mistakes Tampa Bay typically makes. Even still, the Lightning were in the game until the third period, despite that. The Tampa Bay Lightning beat the Toronto Maple Leafs 6-4. It only took them 55 games to do it, but for the first time all season, the entire Lightning team left all of their baggage at the door and played a very business-like game. It was very calm, practical, no-nonsense, and very workman-like. And that was very refreshing - and a big reason why I think they won. St. Louis had the best game. He ran the ice in that first period. That goal line goal was just spectacular. You really don't get any better than that. Malone wasn't too shabby with his two goals, either. And to round out that line, Lecavalier's wrap-around was very pretty as well. That line had 4 goals, 4 assists, and 16 shots on goal. They also converted on 3 of their 4 power play chances, kept up on shots all thru the game, and dominated in the face off circle. They stayed out of the penalty box giving Toronto only two power plays, and passing was much, much better this game, too. The passing was like night and day from the last game to this one. Sure, there were some defensive breakdowns, and McKenna could've had a goal or two that got past him, but what matters at this point is that they won. I thought Prospal had a pretty good game as well. He didn't get on the score sheet, but he made some great defensive plays in the first period. The forwards weren't helping out as much with the defense during the second and parts of the third, and I think that's partly why the defensive breakdowns happened. The Tampa Bay Lightning lost to the Atlanta Thrashers 3-1. Okay, usually I think that the reviewed goals are pretty on - as strictly interpreted according to the rules. And, in this case, I can see why they called Stamkos's penalty shot a no-goal. They ruling on the ice was that it didn't go in. In the video, there's no absolutely conclusive evidence that the puck actually went over the line. It's totally inferred - the puck went into the goalie's glove, and the glove went over the goal line, but you can't tell if the puck dropped out of the glove and onto the ice before the glove crossed the line. It's so not right, but what can you do? However, the officials don't call anything else so strictly, so why do they do that with the penalty shots? Maybe because it's the officials in Toronto that make the call and not the guys on the ice? Either way, it's terribly inconsistent. And I think that's what annoys people the most. The non-goal earlier by Roberts, by the way, was the correct call. He did interfere with the goalie, and he did have some opportunity to get out of the way. And the Thrasher player did not push him into the Atlanta goalie. The Lightning's biggest problem was passing. They were sloppy about it, and their passes kept getting picked off. They were also making long passes through the neutral zone, which didn't help matters, either. And it wasn't just the guys passing, but the guys receiving - they weren't prepared for the puck and that caused problems for them breaking into the offensive zone. The whole passing thing wasn't all that great, no matter how you slice it. And that's mostly what did them in, I think. Their energy was good. Sometimes I think they have problems pacing themselves in that regard. And they did a great job on shooting more often and consistently throughout the game. But then, face offs weren't the best. And they couldn't convert on the power play, despite having five tries at it - which was alright since neither could Atlanta. Unfortunately, they did manage a shorthanded goal. You know, it's as if, when they do one thing particularly well, another aspect of the game has to suffer for that. I'm not sure why that is. Although, I suppose it's only natural to do that, now that I'm thinking about it. As mentioned in the comments of the previous game blog, there was the first of a two part feature on Lecavalier and racing on during the pregame, and again during the second period. The second part of the feature will be shown before and during the next game. I had two thoughts on this. One, the only racing that goes on in the Seattle area - where I grew up - are the hydroplanes races on Lake Washington during Seafair. Vancouver has their grand prix, but not a lot of people in the Seattle area knows that goes on. It's like a whole 'nother country up there or something. So we stick with the fiberglass boats that have jet engines strapped to them. Or used to use jet engines. I'm not sure anymore. But the wipeouts are pretty impressive, I have to say, particularly when you consider that they're going 150+ mph on occasionally choppy water. And two, good for him that he's fulfilling a lifeling dream. You know, he's in a position would he should be doing things like that. So take advantage of it while you can, you know? The Tampa Bay Lightning beat the New York Islanders 1-0. It was about what I'd expected. The Lightning came out strong in the first and then faded as the game went along. They had 16 shots on goal in the first period, and then a total of 12 shots on goal for the last two. Consistency would've given them a more goals. Still, they manage to win, and that's what matters. McKenna actually looked a bit nervous in this game. I'm not sure if it was a case of being in front of the home crowd, or that it had finally sunk in that he was starting his second game in a row in the NHL. He still did very well, though - and got the shutout this time, too. I liked the way that various members of the team decided to stick up for Lecavalier during the first period - for tonight, anyways. There was the Smaby-Jackman fight on the opening faceoff. Then Downie stepped in between Lecavalier and an Islanders. And Malone did the same as well a bit later. So where has this been all season, huh? The second period was all about the tackle hockey. Bodies were flying everywhere, and, sadly, it wasn't necessarily because people were intentionally hitting each other. But it did make me think about how nobody throws open-ice hip checks anymore. At least, not how they're supposed to be done, anyways. These days, it's almost always accidental if it happens. I guess there's always danger of hitting someone that knee-on-knee, among other things. The game had a good tempo, and the guys came out ready to play. But, honestly, there wasn't a lot going on but running around. The Lightning dominated on faceoffs, but shots were equal, nobody scored on the power play, and even most of the penalties were off-setting. In theory, that's good; but in reality, that's not all that great considering that the Islanders are dead last in the league. There were some nice stretches where the Lightning dominated the Islanders, but nothing came of it. Still, everyone knew where they were supposed to be, and what they were supposed to be doing. And it was good to see that they're being more patient with the puck than they have been. As you probably already know, Jokinen was traded to Carolina today for LW Brookbank, D Melichar, and a draft pick. In case you were wondering, word is that they didn't actually want Brookbank, and Melichar is destined for the minors. So, obviously, they were just trying to get rid of Jokinen and didn't really care what they got back in return. In case you missed that. "...Caputi let slip an interesting behind-the-scenes detail about Pittsburgh's huge rally to beat the Tampa Bay Lightning the other night: That Malkin offered up $1,000 between periods if the Penguins came back to win." So why is Crosby captain of this team again? The guys over at Hockey Night on Long Island blog have graciously asked someone from the Bolts Blog to speak on their online radio show Saturday afternoon, and I get to be the lucky individual. As of right now, I've been told that I'll be on around 4:10 pm ET that afternoon, and we'll be chatting about the Lightning and the Islanders game going on that night, as well as the game last Tuesday, for about 10-15 minutes. I'll also probably be in on the NHL trade deadline online radio show for Hockey Prime Time on March 4th. Not sure of the specifics just yet, tho. But I'll let you know when I know. So if you'd like to listen to me discuss hockey and the Lightning, this is your chance. Here you go. Enjoy! For those of you who feel that NHL officials are unfairly targeting the Lightning, please consider this. And if you're still unconvinced, I can probably come up with other articles about it. It's not them - it's the officials. Or, more likely - and perhaps more accurately - the NHL itself. The Tampa Bay Lightning lost to the Pittsburgh Penguins with 16 seconds left in overtime by a score of 4-3. The Lightning had a shutout going up until 2:25 of the third period. Going into the third, they were ahead 3-0. The Pittsburgh scored four unanswered goals. Crosby was pretty much invisible, but Malkin was pretty much unstoppable - particularly in the third period and overtime. I felt bad for McKenna. He should've had a shutout in his NHL debut. But he didn't. Despite getting four goals scored on him, I was very impressed with McKenna's poise in goal. This was his first NHL start against two of the league's leading scorers, and he played like a 10-year veteran. His calm demeanor really reminded me a lot of Martin Brodeur, actually. Sure, he had his defensemen dropping like flies to stop pucks in front him, but he did very well on his own, too. If this is how he normally plays, the Lightning might have quite the goaltending tandem. There is just one glaring stat that stands out above the rest. The Lightning had a total of ten shots on goal for the second, third, and overtime periods - altogether. That's it. Just ten shots on Fleury for the last 45 minutes of the game. Okay, before anyone goes off on the officiating, I'd like to go off on the players. I'm sure the fans aren't the only ones thinking that the officials have something against the Lightning. Most likely, the players do, too. So why in the world, if you think the refs are going to call any little thing against you, would you play sloppy? Because they did, and it cost them. Obviously. I think the officials did a good job calling this game. Better than usual, anyway. The number of power plays were the same for both teams - they had six each. In total, the Lightning actually had one fewer penalty called on them then the Islanders. So much for the officials favoring one team over the other. I'm not counting Lecavalier's fight in that at all, though. Someone really needed to step in and let the Islanders know that it's not okay to run the Tampa Bay goaltender. It probably should've been a defenseman, but whatever. Lecavalier stepped up and did the job, even though you could tell that his heart wasn't really in the fight. Still, you've really got to respect him for doing that, regardless. Speaking of the defense...why were they playing like Smith was behind them? Ramo wasn't at all prepared for that, and it showed. Not to demean Ramo or anything, but Smith is a bit more independent and is ready to deal with whatever comes his way. He's had to with the way this season has gone. Ramo seems like he's been playing with the defense on his AHL team instead of on his own. I don't know, but there was some kind of mental block going on there with the defense. I'll give it to McKenna, though. He didn't look the least bit nervous in his first NHL action. And it looked pretty steady in net, for the most part. Although, if I were in his shoes, I would've been figuring that I couldn't do any worse than Ramo did - not that much of that was Ramo's fault. But even still, there really wasn't much pressure for McKenna. That's not a bad deal, if you think about it. Actually, the most of the team had this mental block going on for most of the second period. Well, except for Lecavalier, who was trying to redeem himself from the penalty called on him that gave the Islanders their first goal of the game, which was a power play goal score on the Lecavalier penalty. Halpern and Meszaros also had a pretty good second period as well. However, three goals in 3:25? And they cruised thru the rest of the second like they were ahead instead of being down three goals! There was absolutely no sense of urgency about them at all. As usual, the third period was better. They finally played like they should've been all game long. Lecavalier, Halpern, and Meszaros dragged the team along with them through the second, so I wonder if any of them let them all have it during the second period intermission. Whoever it was that finally got them going, it came too late since the Islanders had the momentum. Hopefully, they'll pull it together for the game in Pittsburgh. Here's a list of some unrestricted free agent defensemen that the Tampa Bay Lightning could be looking at. Obviously, some of these guys won't be moving at the trade deadline. But it's something to think about. They're ranked by points per game, and are care of James Mirtle from From the Rink. I'd post the list and highlight the ones I think would be a good fit for the Lightning, but this layout thing is pretty screwy. Darn formatting anyways!